I have a love-hate relationship with animals in the outdoors. Some of them clearly love to hate me. Yes, as a matter of fact, I have been in hiding. It is difficult to crank out blog posts when you are hiding under the desk. Maybe it had something to do when my last bike ride almost turned into an horrific scene reminiscent of Alfred Hitchcock’s The Birds. Opening scene: The camera pans a bucolic country road of rolling hills and then focuses on an old farmstead with fading paint and a picket fence, and a stand of stately cottonwood shade trees. Along the barely two-lane road, the picture picks up a pack of strolling peacocks, some of which were strutting colorful plumage in a perfect picture of rural serenity. Then the camera zooms in on an approach of a Tour de France wannabe, replete with body-conforming Latex bike shorts and a colorful skintight biking jersey, which leaves the viewer with no doubt that body-conforming is not necessarily a good thing. As the background soundtrack rises to a menacing crescendo. 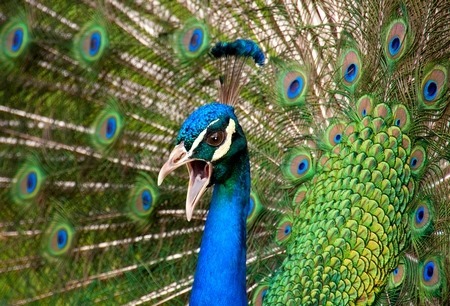 the peacocks turn in unison, glaring in annoyance of the advancing bike rider. 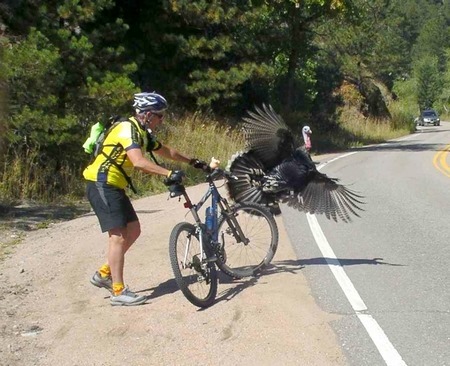 The pudgy, hirsute bike rider skids to a stop just at the sight of the larger-than-you-might-think birds as they appear to be sharpening their claws on the roadway. 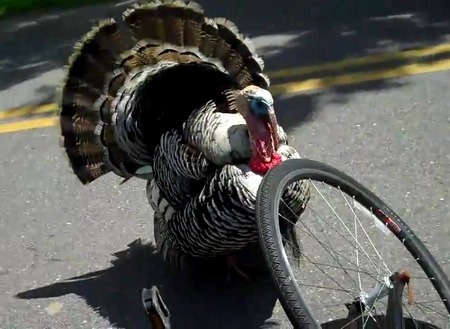 In a rare instance of good judgment, I…I mean the bike rider in the movie…flips his bike towards home and pedals furiously while frequently peering over his shoulder, checking if a flock of angry birds have taken flight in his direction, knowing that they can fly a lot-better-than-you-might-think. Unbeknownst to the bike rider, like an unending Grade-B horror flick, the dangers had taken but only a brief hiatus. 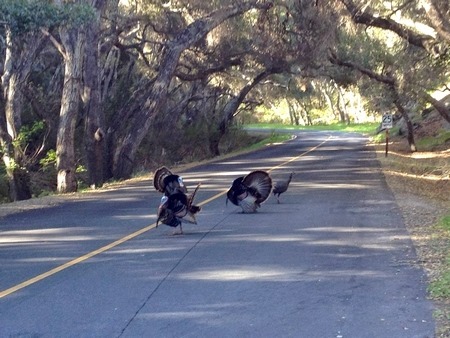 Just as the hapless central character of our story makes the final turn for his home, he glances at a troop of wild turkeys strolling peacefully down the middle of the road. Given the encounter with the peacocks just moments prior, and now seeing the very large turkeys beginning to form a gauntlet along the only road to home, as the background music foretells that a character in the movie is about to bite the dust, a flashback begins of another wild bird encounter some many years previous. Like a Quentin Tarantino saga, alas this ends the story contained on Reel One. In the meantime, it’s back under the desk. Cue, woeful, haunting melody as the credits roll.